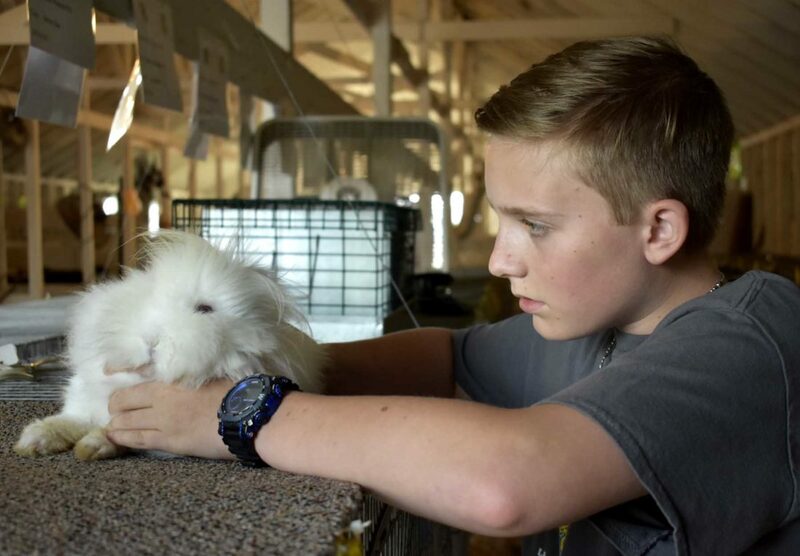 -Messenger photo by Chad Thompson Ryan Fink, 14, of Belmond, holds his rabbit, Lacy, at the Wright County Fair Thursday afternoon. Fink is in the 4-H club, Britt Broncos. He said care is the most important part of showing rabbits. 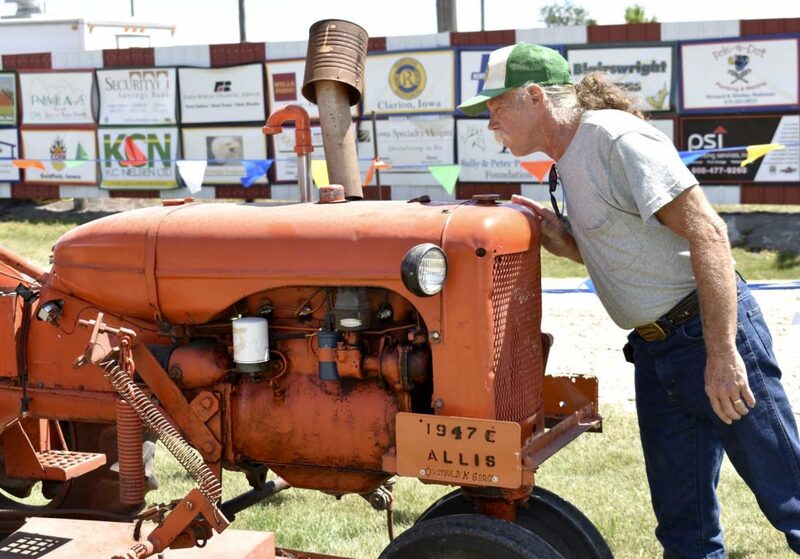 -Messenger photo by Chad Thompson Dave Pohlman, of Cabot, Arkansas, looks over a 1947 C Allis antique tractor at the Wright County Fair Thursday afternoon. -Messenger photo by Chad Thompson Brayden Frakes, 5, of Eagle Grove, front, and his twin brother, Tristan Frakes, in blue, reach in to pet a sheep during the Wright County Fair Thursday afternoon. 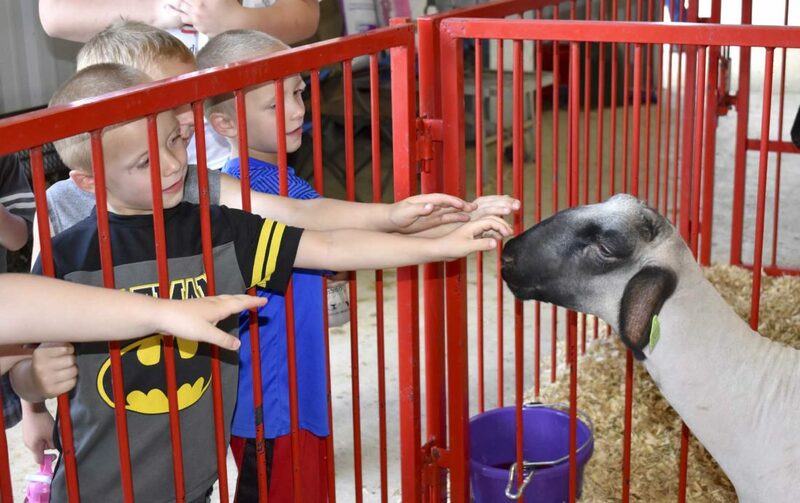 EAGLE GROVE — Rabbits, sheep and antique tractors weren’t the only things on display at the Wright County Fair Thursday. A relatively new game called gaga ball was played throughout the afternoon at the Wright County Fairgrounds. Leo Johnson, 11, of Altoona, was among the dozens of kids who participated in the game. Gaga ball is an activity that has been growing in popularity in recent months, according to Johnson. Each game is started with players standing against the wall on the inside of a hexagonal fenced-in “pit.” The pits are normally between 15 and 20 feet in diameter. One player then tosses the ball into the middle of the pit. The ball must bounce three times, then players can leave the wall. The object of the game is to hit an opposing player below the knees. If a player is hit below the knees, that player is out and must leave the pit. Players can only hit the ball with their hands. If a player hits the ball out of the pit, he or she is out. Once the player hits the ball, he or she must wait until the ball touches someone else or the wall before hitting it again. The ball can’t be thrown or carried. “It’s just really fun,” Johnson said. He has played gaga ball elsewhere, but Thursay was the first time he had played it in Wright County. The game appeared to be very inclusive for kids of all ages. Johnson said he hardly knew anyone playing the game, but jumped right in. Emma Miller, 7, of Eagle Grove, said the game is comparable to soccer, only hands are used instead of feet to bat the ball around. “It’s the opposite of soccer, and I really like soccer,” she said. Joey Goodwin, 13, of Manson, was impressed that Eagle Grove had the pit installed. Goodwin planned to camp out with friends throughout the weekend. “I’m just going to hang out today and help some people with their livestock,” he said. Goodwin said he likes the organization of the Wright County Fair. “Everything is kind of all in one spot, so it’s easy to get around,” he said. Elsewhere at the fair, children gathered for Nick’s Kids Show, which involved dancing and music. In one of the animal barns, Ryan Fink was showing his rabbit, Lacy. Fink enjoys telling people about his rabbits. He said Lacy is a lionhead rabbit. 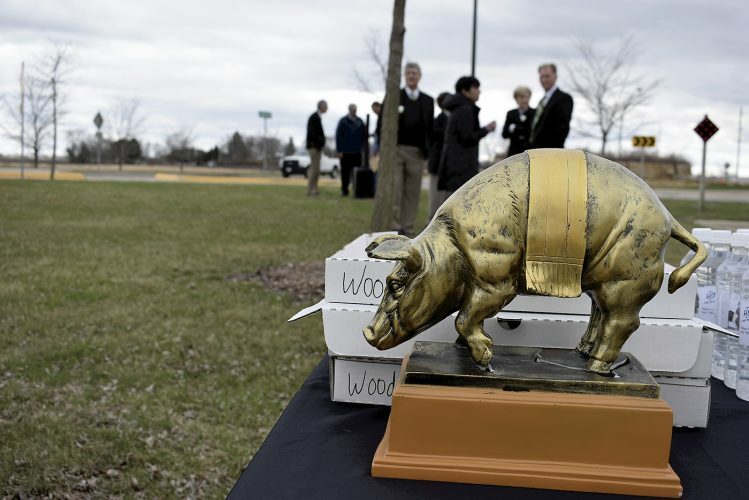 Care for Lacy is most important, Fink said. Fink said he is most proud just to be able to show the rabbits at the fair. Lori Olson, of Eagle Grove, decided Thursday was a great opportunity to take her grandkids to the fair. Her granddaughter, Jaden Sadler, 5, liked seeing the animals. Taytum Edwards, 7, another of Olson’s granddaughters, said she liked the bunnies too. Olson’s grandson, Isaac Sadler, 8, enjoyed going through the 4-H exhibits. “The yarn stuff was really cool,” he said. While some people enjoyed time with their families at the fair, others were in town to remember lost loved ones. Dave Pohlman, of Cabot, Arkansas, came to visit Eagle Grove, where some of his family is buried. “I am here to visit my kinfolk and pay my respects to aunts, uncles and grandparents who passed away,” he said. Pohlman, who lived in Eagle Grove in the 1950s, spent part of the day at the fair. 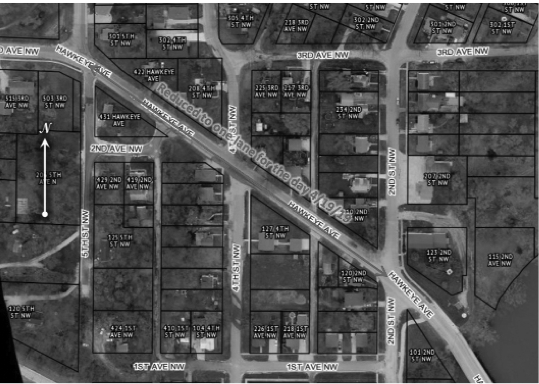 Pohlman said he used to work for a railroad company. He stopped to see the antique tractors on display. A 1947 Allis-Chalmers caught his eye. “Mower decks on something this vintage are few and far between,” he commented. The tractors remind Pohlman of his childhood. “Being from Eagle Grove and being a small child on the farm, I still have that love of tractors,” he said.